In 1935 the U.S. Congress declared the first Sunday in August as National Friendship Day. Send flowers - The yellow rose symbolizes joy and friendship and is named the official flower of Friendship Day. Write a note - Tell someone how much their friendship means to you. Invite a friend for a walk, share a picnic or a cup of tea. Visit an art gallery together. Host a sleepover and watch a movie. Make Friendship bread. You can find recipes and the story behind the bread online. In 1997 the United Nations named Winnie the Pooh the World Ambassador of Friendship. Debbie Macomber helped relieve my fears and answer some questions in her book Knit Together; Discovering God's Pattern for Your Life. Debbie will make you laugh and grab the Kleenex box as she shares her own journey of discovering "What now?" My family loves this refreshing dessert in the summer. Quick & Easy! Measure the berries and lemon juice in a 2-quart saucepan. Combine sugar and cornstarch, and add to berries. Stir over medium heat until mixture comes to a boil and thickens. Pour into ungreased 8x8" glass baking dish. Mix dry ingredients together. Cut in shortening until mixture forms coarse crumbs. Stir in milk. Spread spoonfuls across top of hot berries. Bake at 400° until top is golden brown, 25 to 30 minutes. Serve warm or cooled with a scoop of Vanilla Bean ice cream. ENJOY! "Life's short, so eat the hot fudge sundae! Just don't eat it every day." parents to stay during the party. Invitations: You can purchase invitations, or use construction paper and trace around a bear shaped cookie cutter to create your own. Include the party's location (your home or a park), time, date, and what to bring. Ask each child to bring their favorite teddy. 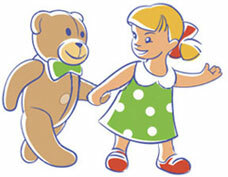 The website www.preschooleducation.com/stbear.shtml posts the words to many favorite teddy bear songs and finger plays. FUN - Before you serve lunch gather your guests in a circle and read The Teddy Bears Picnic by Jimmy Kennedy. Introductions: Ask each child to say their name and introduce their bear. Have them share when and how their bear came to live with them. Invite them to tell an experience they've had with their bear, maybe the time he went missing, or tell why their bear is special to them. The kids creative stories will make you smile. Spread a large table cloth or blanket on the ground. Serve sandwiches - peanut butter & jam, ham & cheese. Fruit & Veggies - strawberries, blueberries, grapes, celery & carrot sticks. Cookies - Any kind will do; oatmeal raisin, chocolate chip, or even a package of cookies from the store. If you want to get fancy www.cookiecuttershop.com offers several bear shaped cookie cutters. They even have a dancing bear and a polar bear. Note: You can also make bear shaped sandwiches by using the cookie cutter. Most importantly, you want your picnic to be fun and stress free for everyone, and that includes you. "Many hands make the work light." So share preparations by asking other parents to help out. Bear Relay. Mix the kids and adults in to two teams and see which team can pass the bear the fastest. More Great Bear Books: Little Bear by Else Holmelund Minarik, Winnie the Pooh by A. A. Milne, Bear Snores On by Karma Wilson. Bombarded by media bent on reporting bad news, sometimes it's tough to stay positive. Here are a few things I do to maintain perspective. Start fresh - I journal each morning. This helps me work through the frustrations in my life and clear the clutter from my mind. Go to God - I read my Bible and spend time in prayer. I feel better after a chat with someone who loves me like no one else, and always has my best interest in mind. I also read from a devotional book. These provide a great way for moms with young children to jump start their day. A verse coupled with a short devotion will focus your thoughts on God. Laugh - God's word tells me there's a time to laugh - Ecc.3:4 - and that laughter does a body good - Prov.17:22. So whether it's squirrel antics in my backyard, a funny show on TV, or something comical I read, I find a reason to laugh. Breathe - Taking deep breaths relieves tension. Surrounded by Beauty - I keep a vase of fresh flowers on the table year round. Even a single rose, mum, or gerbera daisy brightens my world.